Follow the coast road to Crail,and when the main road turns sharply opposite the Golf Hotel,take the side road there that is signposted for Roome Bay and The Balcomie Golf Course.This is also the road that you take to go to the car boot sales,and also the Crail Thrash. Follow this road right out of town and along past the old aerodrome.You'll pass a couple of entrances on your right for the boot sale and also some industrial units.Keep going past them,(around a mile out of town),until you come to a turn off to your right which is signposted for a picnic area,and also a civic amenties site.Take this turn off and drive all the way down as far as it will take you.You will come to a spacious car park at the picnic area.This is the entrance to Kilminning Nature Reserve. If you now look over the fence towards the sea you will see a very large lump of rock on the beach.This is known as Kilminning Castle Rock and is your destination.There is a gate with a style at the right hand end of the carpark looking towards the sea,take this path and follow it down to the shore. 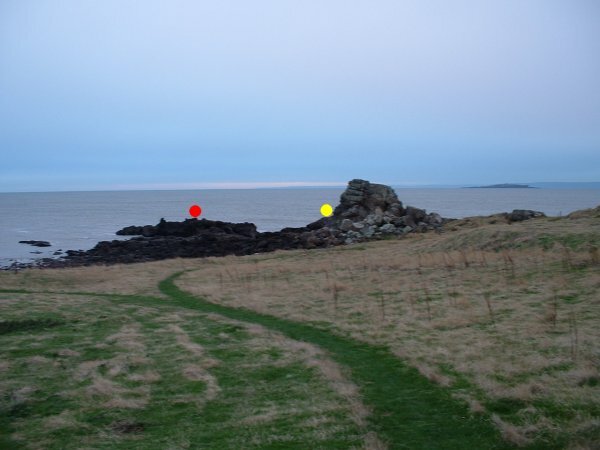 Although you can't tell from the above picture very well,the rock to the left of the Castle Rock becomes an island at about half tide.There are two ways to fish this mark.From half water down,go onto the rock marked with a red dot,and from when the tide closes around the 'island' fish the yellow dot right up to high tide. This photo shows the flat rock to the left of the large Castle Rock at about 1 hour to mid-tide.The causeway that you can see is your access,but becomes covered around half tide on a normal day. 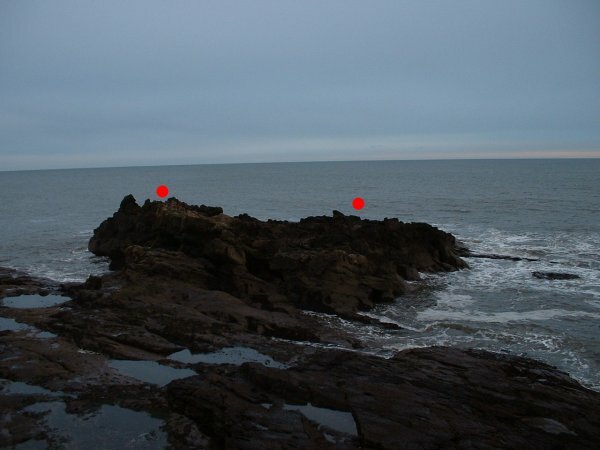 The dots shown in this picture are simply two of the best spots to fish on the rock.This mark has pretty deep water and so is very good either for red cod and wrasse in the summer,or green cod in the winter,and all crab,worm,and shellfish baits will work well here.You should have between 4 and 6 hours on the low rock mark before the tide cuts you off,depending on the state of tide on the day.Be warned though that the ground here is pretty rough and expect high tackle losses. Be warned also that there is a bit of a scramble over to the low rock,as the rock formations are quite unusual and footing is tricky.There is also a bit of a climb onto the rock itself which,although posing no trouble to a reasonably fit person,will be difficult for older anglers,and impossible for anyone with a disability.Needless to say the low rock mark is not suitable for rough weather conditions,and access or exit in the dark will be extremely tricky.